Women will do anything to preserve the beauty of the crown hair. Understandably, hair is one of the elements of beauty of the female body. But how many of us, women, who have been free of all the myths about hair loss? Eighty percent of cases of hair loss is not broken, but not because of the hair roots strong. It's a myth or fact? The answer is, FACT, and the percentage that is the result of tests carried out in England in 2008. Not only that, most of the hair care products that claim to deal with hair loss can only handle the actual loss due to hair breakage, not because the roots of the hair is not strong. This means that beredaran products on the market are often the solution is not appropriate for the problem of hair loss. Next fact is a survey conducted by Edelman IndoPacific in 10 cities across Indonesia. 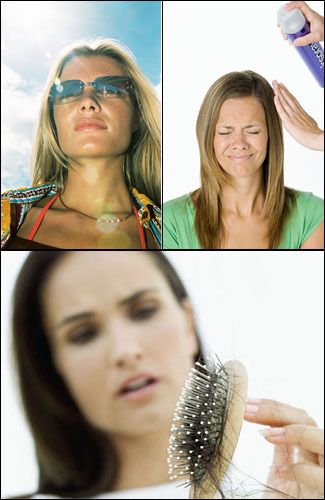 The survey revealed 70 percent of Indonesian women experiencing hair loss. If seen from the variation of age, female hair loss can be experienced at any age, ranging from 16 years to 45 years and over. But do not be afraid to read the facts. As it turns out, the stress it triggers hair loss. Once acquainted with the causes of hair loss from proven facts, we must also know what myths can trigger our fear of hair loss. Because believe the myth it would trap us in the problem of hair loss is more severe. This is clearly a myth! Because sunlight is limited to the surface of the hair only, while hair loss occurs because the hair follicles are fragile. Until now there has been no survey or scientific research that supports the statement. Its lay language, the statement is a myth. It's when we wash with shower scalp will be healthier because shampoo can be cleaned without harming folikelnya. The fact is, the follicles under the skin is not sensitive to physical stimulation. In fact, the massage that causes friction between the hair and then make hair break. So, be careful when massaging the scalp because it may be our hair "pain" and loss due to fracture. Although dandruff and hair loss often occur simultaneously, the fact that there is no relationship between the two. Actually what happens is the itching caused from dandruff makes us scratching our heads and rub against each other so the hair brittle and fall out. This is then believed by many as dandruff cause hair loss. After freeing himself from the myths of hair loss, it is understood dong, how to maintain the beauty of our hair crown. Make sure we always choose hair care products that really strengthen and nourish the hair roots. When the hair follicles healthy and strong then we can boldly say, no more hair fall! Hi friends! I am Sharma from Delhi I am telling about my hair transplant. Before few months my hair fall was very much and I was so worried about this hair fall. I was visiting most Hair clinic for treatment but no Body could stop my hair problem. But thanks to my friend which can tell me about Klinik Esthetika. This clinic so good they have the latest technology and experienced doctor and after few months my hair fall is stop and grows. Thanks to Klinik esthetika to stop my <a href="http://www.klinikesthetika.com/hbt-advanced-hair-fall.php”>Hair Fall Treatment</a>.